Step 1 – After starting Pilot3D enlarge the “Front View” to use the whole window area. You don’t have to do this, but I prefer working on one large window at a time, rather than four small, separate windows. Step 2 – Create a centerline to use as the rotation axis for the awning. 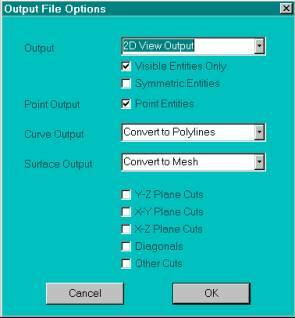 Select the Curve-Add Polyline command. This command allows you to create a line or polyline by picking the points with the left mouse button and terminating the shape by picking the right button. In our case here, you want to enter specific coordinate values for the center axis. This can be done by entering the (x,y,z) values of the point instead of picking the left mouse button. So, after selecting this command, type in “0,0,0” (without the quotes), followed by the enter key. This will put the first point of the center axis at the origin. Next, enter “0,0,3” to put the second point at 3 feet above the origin. Then press the right mouse button to terminate the polyline input. You should see what is shown below. 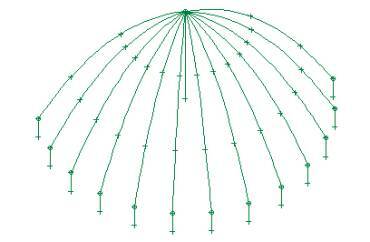 Step 3 – Create the parabolic cross-section shape of the awning. 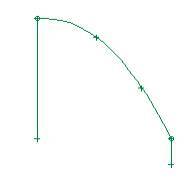 You want to use the Curve-Add Curve command to add a curve, starting at the top of the center axis. The Add Curve command works like the Add Polyline command in that you enter curve points with the left mouse button and you terminate the input using the right mouse button. However, for the first point, you want to “snap” it to the top of the center axis polyline. This is done by positioning the cursor near the top edit point of the axis line and pressing the ‘p’ key on the keyboard (snap to a Point) rather than picking the left mouse button. 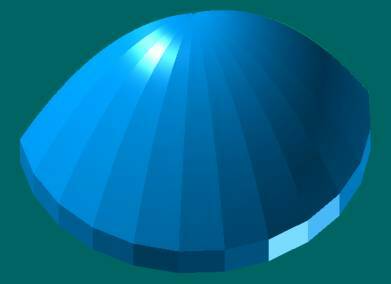 After you do this, you want to use the left mouse button to add a few points to define a nice parabolic shape to the curve, as shown below. Don’t worry about the straight, vertical piece at the bottom. You will add that in the next step. 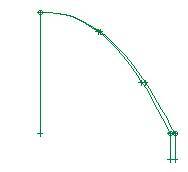 Remember to use the right mouse button to terminate the parabolic curve shape. Also, don’t worry about getting the exact shape that you want right now. You can always go back and use the Edit-Move Point command to change the shape of the curve after it has been created. Step 4 – To add the short, straight vertical piece at the bottom, you want to use the Curve-Add Polyline command. Remember to snap the first point of the polyline to the bottom of the parabolic shape using the ‘p’ key on the keyboard. Step 5 – Use the Edit-Move Point command to change the shape of the cross-section curves until you get the shape that you want – something like the picture shown below. If you move and separate the common point between the parabolic part and the vertical straight piece, you can use the Edit-Merge Pnt To Pnt command to make sure that the two pieces remained attached. Step 6 – Now that the center axis line and the parabolic cross-section shapes have been created, it’s time to make copies of the cross-section curve and rotate them about the center axis. 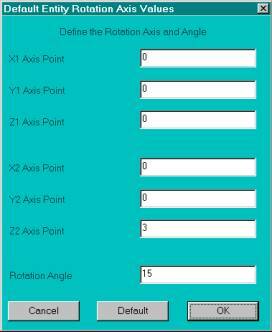 To make the job easier, you need to first tell the program what you want to use for the central rotation axis. This is done with the Modify-Rotate Entity/Group-Pick Rotate Axis 2 command. This command lets you pick two points to specify a rotation axis. 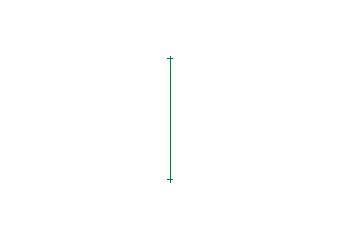 After selecting this command, use the ‘p’ key to snap or pick the bottom point of the center axis polyline. Then use the ‘p’ key again to snap or pick the top point of the center axis. 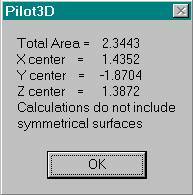 You will immediately see a dialog box like the one below that shows you the two points that you picked for the center axis – (0,0,0) and (0,0,3), which are the two coordinate values you originally used to create the center polyline. You should also go to the “Rotation Angle” field and enter 15 for the rotation angle, since we will be creating awning surface panels that cover 15 degrees of the 180 degree half-circle shape of the awning. Once you have entered the 15 degree rotation angle, pick the OK button. Note that nothing happens yet, since this just sets up the default rotation axis. Step 7 – Select the Modify-Rotate Entity/Group-Copy Rotate by Axis +Angle command and then pick the parabolic curve. You will see the same dialog box as shown above (already filled in), so just pick the OK button. This command will create a copy of the first parabolic curve and rotate it by 15 degrees around the center rotation axis. Since the bottom vertical piece is a separate entity, you need to pick that one separately to create a rotated copy. This means that you can keep using the Copy Rotate command for each curve, one right after another. After using the Copy Rotate command for each part of the cross-section curve, you should see something like what is shown below. Step 8 – Since the default rotation angle is 15 degrees, you need to keep using the Copy Rotate command on each of the new curves that are created (not the original cross-section curves). Keep using the Copy Rotate command until you have added 12 new parabolic curve shapes and 12 new vertical pieces, as shown below. Step 9 – To verify the shape, you can select the “3D” command on the toolbar as, shown below. Then you can use the rotate commands (the ‘Z’ buttons with the clockwise and counter-clockwise arrows) to better view the shape that you have created. The “UP” and “DN” (down) buttons allow you to tilt the shape up or down while you rotate it back and forth. 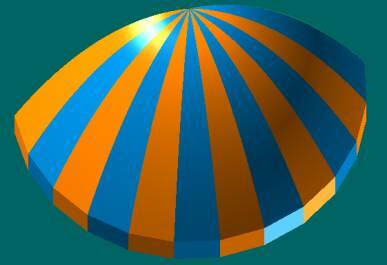 After rotating and tilting the shape, you should see something like what is shown below. 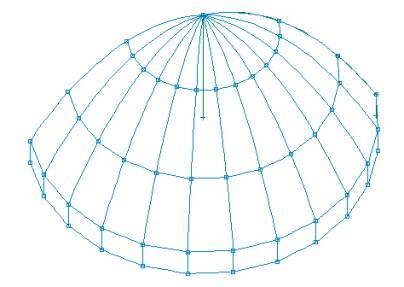 This shows the 3D wireframe shape of the awning, which is ready for skinning with surfaces. Remember, our first goal is to define all of the seam or structure lines with curves, which we have just done. 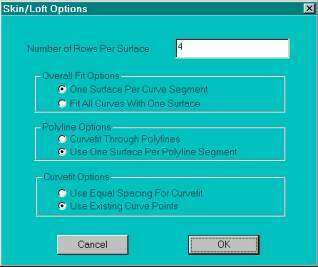 Step 10 – To fit the area between each set of two consecutive curves with a surface, we need to use the Create 3D-Skin/Loft command. After selecting this command, you need to pick (left mouse button) each curve (in sequence order) to tell the program which curves to skin or fit with a surface. In our case here, we will be skinning or fitting a surface between each consecutive set of cross-section curves. In other words, we want to fit surfaces to each of the 12 separate sections of the awning. As you pick each curve, you need to pick the curves near the same ends. This tells the program how to connect the two curves with the surface. [Remember that what is obvious to a human is not so obvious to a computer program!] Once you have picked two consecutive curves, pick the right mouse button to show the dialog box below. For the parabolic curve part, you want to make sure that the “Use Existing Curve Points” option is picked. This is not required, but it makes a better fit for this example. Next, pick the OK button to create the surface. Below is the same view in the View-Render View option. If you want to change the default colors of a surface, use the right mouse button and click on the surface (somewhere other than along a common edge between two surfaces). This will display the attribute/option box for the surface, as shown below. 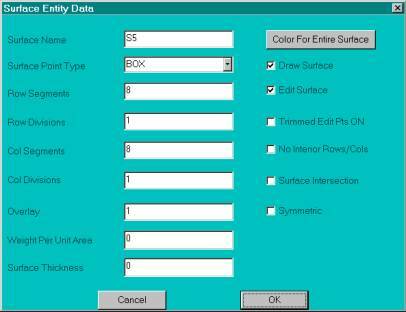 Notice that one of the options is a color choice option that you can use to set the color of the surface. Below is what the awning looks like when every other surface has been changed to orange. Step 12 – Now you can unwrap or layout any surface that you want using the Develop-Develop Plate option. After selecting this option and picking a surface, you should see the dialog box shown below. It contains many options, but for now, you can accept the default options and just pick the OK button. After the calculations are done, you will see a dialog box like the one shown below. Pilot3D uses a finite element analysis technique to flatten out the 3D shape into its 2D pattern. In this case, the shapes are simple with no complex curvatures and no strains in the material. After you pick the OK button, you should see the following pattern for one of the parabolic surface sections. This is the 2D pattern for the rectangular section. Of course, we didn’t need to model the entire 180 degree awning shape if all we wanted were the two patterns above, since all of the patterns are the same. However, the complete model is nice for viewing and marketing purposes. Step 13 – To get the full-size plotted patterns, just use the print command. [You may need to go to the Options-Mod/Doc Definition dialog box to set the values to a user-selected scale factor and set the scale to 1 foot equals 1 foot.] To send the patterns to a CNC machine compatible format, you need to display the pattern on the screen and then select the File-Data File Output-DXF Output command. The following dialog box will appear. 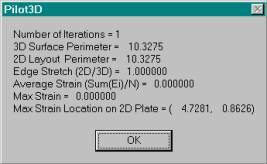 The only value that you have to change is the Output field from 3D output to 2D View Output. Then pick the OK button. 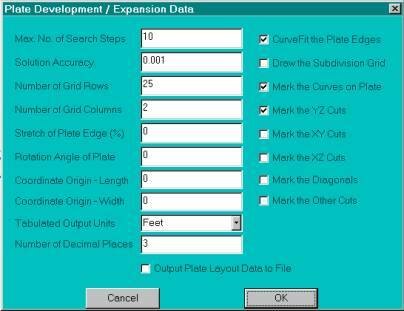 Step 14 – If you want to calculate the amount of material you need, select the Calc-Surface/Group Area-3D Area command. 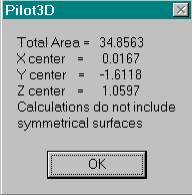 When you pick a surface, the 3D area and center will be calculated and displayed as shown below. 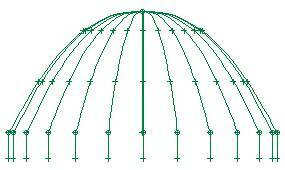 To get the total area of the awning, you will have to multiply the sum of the areas of the two-surface section by 12. That’s it! This process is not completely automatic, but with a little bit of practice you will be making 2D patterns for some complicated, creative shapes.